Echinocactus or ‘Barrel Cactus’ are a group of large growing cactus that thrive in the sun. The name ‘Barrel Cactus’ gives away the shape. Easy to grow in a well drained soil and a sunny position. They are slow growing plants so mature specimens are sought after and can cost a little more. Excellent in a container and they work well with many forms of contemporary architecture. These plant do flower, and in fact flower for long periods in summer once established. The ‘Golden Barrel Cactus’ Echinocactus grunsonii (pictured) is one of the better known species. Echinocactus platyacanthus is the Giant Barrel Cactus and Echinocactus texensis is sometimes known as the horse-crippler cactus, an interesting name and a conversation piece. Some Barrel cactus are found under Ferrocactus. In a well drained soil and a sunny position these are an easy care plant. They grow well as far south as Melbourne, however are not great in tropical to sub tropical conditions. Maintenance is minimal and root systems are not seen as invasive. The only real problems are related to poor drainage or overwatering, we doubt that these tough plants would ever require watering outdoors, and indoors only a few times a year and certainly let the soil dry out between waterings. 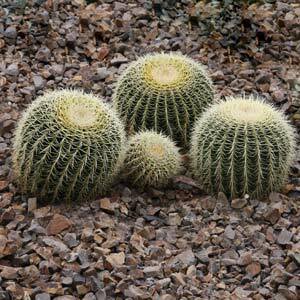 You can grow Barrel Cactus in the garden or in a container. In a container they tend to be smaller growing, they do require a free draining potting mix and a sunny position. They do well indoors on a sunny windowsill. Water only when dry and fertilizer with a liquid or slow release fertilizer. Soil – A growing medium that is free draining is essential, we suggest a raised garden bed or use a regular cactus and succulent potting mix for best results. Position – Barrel Cactus prefer full sun. Fertiliser – A 1/3 strength application of a liquid fertiliser in spring and again in summer is generally enough. Echinocactus grunsonii commonly called the Golden Barrel Cactus. Echinocactus texensis, also known as the ‘Horse Crippler’ and ‘Devils Claw’.